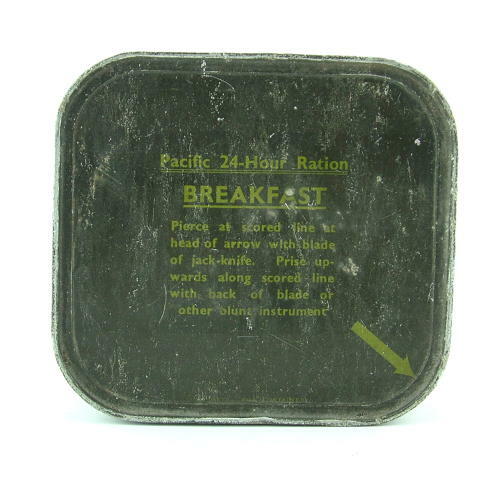 Pacific 24-Hour Ration - Breakfast. Metal tin approximately 14 x 13 x 4cm. Dark olive drab painted and marked on the lid with instructions for opening. Fully sealed and complete with original contents. Issued as part of the larger ration kits including midday snack and supper. Has surface wear, paint loss and small dents but in fairly good overall conditon. These formed part of the survival kits on multi-engined aircraft in the Far East. Rarely found. Stock code S21985.